Bitten by Romance - Book reviews and more : Bewitching Book tours: Guest author Mysti Parker Giveaway! Bewitching Book tours: Guest author Mysti Parker Giveaway! First of all, a big thanks to Laurie for having me on this beautiful blog today! I hope you’ll all enjoy my post. I love reading (and writing) romance. It’s a beautiful thing to journey with characters who face tremendous obstacles and finally end up in each other’s arms. But, sometimes I wonder what happens after the happy ever after ending of a romance novel. The perfect couple rides away into the sunset…but then what? Do they get married? Have kids? Is life really happy ever after for them? Yesterday (May 17) was my fourteenth wedding anniversary. I’m married to my high school sweetheart, whom I’ve been with since we were sixteen years old. We’ve been blessed with three wonderful children. Though I’m pretty sure we’re what one would call soul mates, life as a married couple isn’t all hunky-dory. Falling in love was pretty easy, but staying in love takes work. That’s the reality of it, so I can imagine what the fictional couples have to contend with after “THE END”. Let’s make up our own romantic duo. We’ll call them Jake and Judy. In their story, Jake and Judy faced many obstacles on their path to find each other. They survived, and at the end, Jake proposed. Sweet. Now what? Skip forward in time. Nine years and three kids later, John and Judy are struggling. That person who made their hearts go pitter-patter at the end of the book has terrible morning breath, is twenty pounds heavier, and their conversations are relegated to the subjects of bills and childcare. Is there hope for John and Judy? Does this mean that there is no such thing as true love? Was their falling in love just a temporary loss of sanity? Before you get too depressed, let’s consult a few good sources. It says LOVE never fails. It’s people who fail at love. Why? Because love is a choice. It’s more than just a feeling. After years of job stress, kids, and financial woes, those feelings can fade. John and Judy have to work to keep their love alive. Let’s see how they can do that. John and Judy need regular date nights. They need a circle of dependable family, friends, or teenagers to leave the kids with and spend some good alone time together. A good dinner, movie, and uninterrupted time to talk can do wonders. Not to mention surprising each other with those little gestures they used to do while actually dating. The more often they do these things, the more they will see that person they fell in love with. Physical intimacy is very necessary, and not just the sexual kind. John and Judy need to hold hands, kiss often, hug even more often, and sit beside each other whenever possible. Even when they’re with their children, they can do these things, which says “I love you” without words. It’s a good example for their kids as well—to see how a healthy marriage works. John and Judy meant their vows; to hold onto each other until death do they part, for better, for worse, in sickness, and in health. To keep their love alive, they need to be their partner’s biggest fan, even in the challenging times. They need to encourage each other, to support their partner’s passions, and to never turn and run when life throws a wrench in the marriage. In my case, fourteen years of marriage hasn’t always been smooth sailing. But, my husband and I are committed to each other and our family. We were out the other day with our kids for lunch at Olive Garden. An elderly couple walked in. The husband helped his frail wife walk to the table, held to her while she scooted into the booth, and patiently did the same thing when they left. My husband looked at me and said, “Now, that’s love.” He couldn’t have been more right. Q & A time: What are some ways you show love to your significant other? What gestures from your sweetie make your heart go pitter-patter like it did when you first met? Cali stood and flung her bow over her shoulder. There was no arguing with her, not with that stubborn set of her chin and those flashing blue eyes. Damn, she was beautiful when she set her mind to do something. We climbed the narrow path up the cliff side to the ancient temple. Bastivar was a crumbling, pillared fortress carved into the mountainside in honor of the goddess Innessa. Worshippers had long since vanished, and as long as anyone could remember, the only current inhabitants were goblins. “Hidari mi compli,” we chanted, and sneaked inside. Our eyes adjusted to the dim light in the entryway. Down one corridor, a group of three goblins came toward me. I aimed and shot one, then ran back when the other two charged. Cali’s first arrow barely missed my head, but she got one. I shot the last one as she readied another arrow. A great snarling ensued from within the main corridor. A horde of beady, yellow eyes came toward us. She fled, and we ran down the cliff side as fast as we could without falling off. We reached the forest floor, and I looked back. Goblins streamed out of the ruins, so many that some fell off the cliff. There had never been this many before. It must have been a long while since anyone had cleared them out. We sped through the underbrush. Thorns scratched our skin and snagged our leathers, but they were gaining on us. I pushed her on, and she turned to run. Goblins burst through the bush, and I readied my sword. Right and left, I swung, impaling and kicking them off the blade, chopping off spindly gray limbs, a head when I could aim just right. Piles of jerking bodies began to pile at my feet. The onslaught lessened, but before I could catch my breath, another wave of them burst forth. One of them latched onto my arm, its jagged teeth sinking in through the leather. I cried out. Then, an arrow sank into its ugly body. Cali had come back, her next arrow nocked and ready. I shook the goblin off my arm. Still, they came, yet another wave. She pulled me back, stepped in front of me, and held out her hands. Blue fire burst from her palms, like flaming blasts of lightning, but continuous, and dreadfully hot. I had to back away from the intensity of the heat. The inferno charred the goblins, turning them from gray, to black, to piles of ashes before my eyes. The fire consumed every bush and weed, everything in its path, until the goblins in the rear decided they were outmatched. Shrieking, they turned and hightailed it back up the cliff and into Bastivar. Cali stared at her smoking hands. I ran to her, relieved to see that she wasn’t burned. But, she was weakened. I embraced her, letting her catch her breath, her head on my shoulder. I ran my fingers along her braid. Then, our lips met, and nothing else mattered. 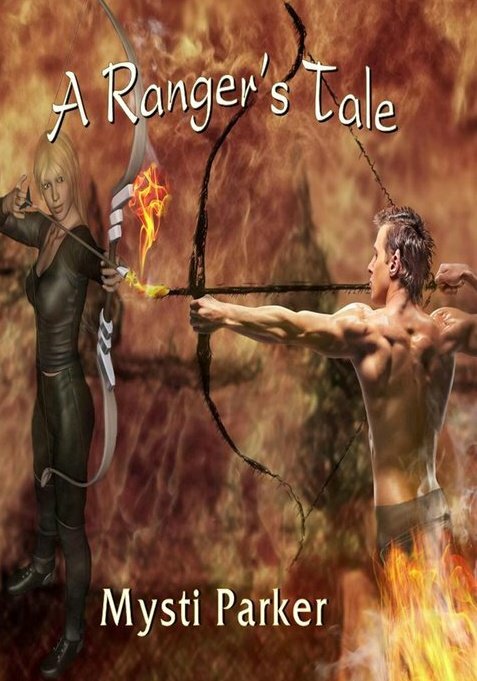 Mysti is giveaway an ebook copy of A Ranger's Tale. Answer the question Mysti asked above and please leave you email. Sounds like a really cool story. Thanks for sharing Mysti. You do have to work on love...we are going through that stage now. We've been together 7 years now and have a 4 yr old son. Things tend to go to a routine style and not anything like the beginning of a relationship. We have been doing a date night more often and getting a kid sitter. One thing that my husband always says is "did I tell you today that I love you?" I always say yes, but I love to hear it again. I'd love a chance to win your book. Please count me in. @Julie--Of course that counts! Not only are you doing something to make his morning easier, but you're saving your family money too! I think it is the little things done on a daily basis that keeps the romance and love alive. You can never hear a heartfelt "I love you" too much. Little love notes left in cars to be found in the morning or afternoon after leaving work, a note or card in a briefcase; a nice hug for no reason; a quick shoulder or foot massage. All these things can tell your significant other you treasure them. I'd love a chance to win your book. Please count me in too. My boyfriend is absolutely terrified of any type of doctor. Dentists too, so I go with him to every appointment. For me he does the dishes, or every once in a while brings me flowers when we haven't had a fight. 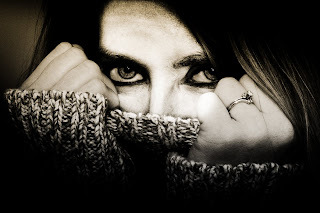 Thank you for the post and the excerpt! @WildABoutBones--Little things really do add up and are so easy to do on a daily basis. One of our little things is we text or leave notes that say, "SHMILY" (See how much I love you). Your real life love story sounds similar to my own! I started dating my boyfriend when I was 16, and we've been together ever since. He meets me by the back door every morning where we share a goodbye kiss. He makes the computer work with a single push of a button after I've screamed obscenities at it. He opens all those hard-to-open jars for me. I think he's a keeper! Thanks Mina--little things make all the difference. The guy could be a sultan but if he never did the dishes or left us a love note, then what good is all that money? BTW, I love the name Caliphany. How did you come up with it? For my heroine's name, I love the way Caliphany rolls off my tongue. I sort of just came up with her name and then everyone else's. High elves like Cali have more formal sounding names. Half elves like Galadin Trudeaux have half-human, half-elven names. Wood elves like Jayden Ravenwing have names that involve nature in some way. Your book sounds wonderful. And, what a great interview... I love paranormal romances. Thanks for the giveaway! 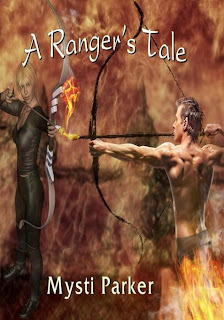 Congratz to Julie S, who won an e-copy of A Ranger's Tale! Thanks to everyone who commented! Have a cup of coffee and grab a good book!